Mountain lovers, hikers and those that simply love sports should get to know the Altai Mountains better. 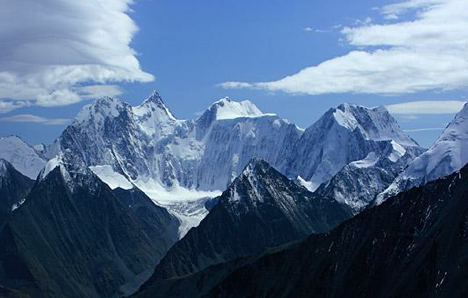 If you are looking for a challenge, then take on Mount Belukha, Siberia’s highest peak. The painter Nicholas Roerich saw it as the heart of Siberia, Altai highlanders thought it was sacred, scientists deemed it to be inaccessible and athletes considered it the ultimate goal. Even today Mount Belukha, surrounded by the glaciers and turquoise lakes of the Altai range, attracts all kinds of people from throughout world because it is Siberia’s highest, most beautiful and most mysterious peak. Those that have managed to reach its ice-covered crest quickly get a sense of the enigmatic and mystical force of the Altai Mountains. Since the 1990s Mount Belukha’s massif has been on UNESCO’s World Natural Heritage list as belonging to the Golden Mountains of Altai. Mount Belukha has two summits that resemble two irregular pyramids: the height of the eastern peak is 4,506 meters, while the western one is 4,435 meters. They are connected by the Belukha saddle, while next to it there are some other impressive peaks: the Delone (4,260 meters) and the Korona (4,178 meters), which form the almost completely vertical Akkem Face. Year round this grandiose mountain towers over the other peaks with its snow-covered caps, and that’s precisely why Russians call it “Belukha” from the word “bely” (white). Indeed, the Queen of the Altai, as it is sometimes called, is covered with snow year round. The climbing season usually begins in May and ends in September. In summer the temperature on the top of the mountains is about 6 °С on average. However, even in summer it can get as cold as −20 °С, whereas in winter it can drop to a frigid −45 °С. Forbes Magazine once included Mount Belukha on a list of mountains that even beginners could climb, but it’s best to treat this inclusion with skepticism as getting to the top of Siberia’s highest peak is considered a difficult and serious climb, as the severe climate, ice and remoteness put the mountain on par with the inaccessible peaks of the Pamir Range. Mount Belukha gained popularity outside Siberia in the 1920s, thanks to the Central Asian expedition of the famous painter Nicholas Roerich, who thought that the Altai and the Himalaya were “two poles, two magnets” connected to each other in some way. When he approached the southern face of the Belukha, the painter was amazed by the area’s purity and fascinated by how far the echoes seemed to travel. Nowadays tourism and mountaineering are well developed in the area. Solo travelers, members of sport clubs, and even regular tourists come to visit this ice-covered mountain. The classic route through the Delone Pass is ranked in the 3A category of the climbing rating system and requires professional skills and knowledge of how to work with climbing equipment, using a short rope, climbing on the rope and using crampons (many agencies offer brief courses on the equipment). But, ultimately being in good shape is the most important thing. Climbing Belukha is not for everybody. It is very important to get acclimatized to the mountain’s altitude before heading to the top. Trekking to the foot of Belukha through the famous Karatyurek Pass will take you 3,080 meters above the Earth. Running, skiing and swimming are all recommended for training.